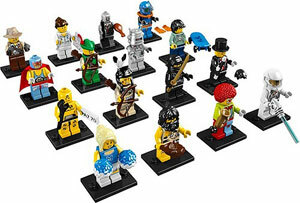 announced a new set of 16 mini-figs (technically spelled “minifigure” with no hyphen, but the collectors’ market insists on putting in a hyphen). What’s unique is that LEGO has never sold minifigures on their own (excluding the key chains, but technically those are keychain minifigures and not minifigures). The boxes aren’t labeled so it’s basically a grab bag. It always seems this sort of quarter machine approach favors the most stupid character(s) of the bunch. Be prepared to get a handful of magicians, cheerleaders, and clowns rather than the samurais, samurais, and samurais. The samurai is my favorite. The 16 are: cheerleader, caveman, clown, astronaut with giant laser, crash test dummy, Native American, samurai, magician, skateboarder, 1950s robot, robin hood, mexican wrestler, cowboy, doctor, silver-faced man wearing a suit and holding a turkey leg and shovel, and a scuba diver.